Tiny, multi-colored lights seemingly hanging in mid-air dance across the night air in a rainbow of colors. A sense of comfort washes over the body as the lights continue to float across the night, relaxing and hypnotizing as the viewer is drawn in deeper and deeper into the dance. Gloving is a type of dance strictly performed by the hands and fingers accompanied by the use of LED lights attached to the fingertips of special gloves. It is associated with the electronic dance music scene. American River College student Anthony Perez said he practices every day on his craft. Vanessa Lamb, Perez’s girlfriend and a fellow glover, elaborated on the frequency of her boyfriend’s practices. Perez and Lamb began gloving last Christmas after being introduced to it after someone gave Perez a light show when he first started going to electronic dance music festivals. Light show is the name of the type of performance that the glover conducts. Perez said he was so intrigued by the experience that soon afterward he bought Lamb a pair of gloves for her birthday and then himself a pair for Christmas. The two have been practicing together since. Inspired by elements of hip-hop dance, moves such as “liquiding,” “finger tutting” and “popping” can be seen in many of the light shows performed by glovers. 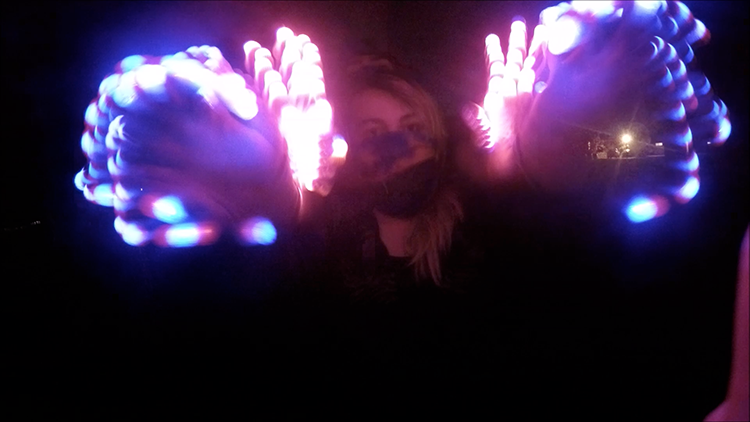 Despite its mass popularity, gloving has been banned at many music events due to many companies’ concern that the dance movement is associated with drugs. Danny Saeteurn is a promoter for Electric State of Mind said he disagrees with the company’s views on gloving. He said that the art form is highly appreciated in the dance music community and has been positive and beneficial in his lifestyle. “Gloving has helped ease my arthritis pain because I’m constantly exercising my fingers,” Saeteurn said. Saeturn went on to say that gloving has even allowed him to meet “some of the most amazing people” that are in his life today. “(The gloving community) is like a huge family,” said Perez. Many glovers will tell someone just starting that gloving takes time and patience. “Don’t get down about people who are better than you, let it inspire you to keep practicing…you’ll get there, Perez said. Lamb insists that there is no right or wrong way to glove and that commitment is key. “(Glove) because you like it, don’t do it if you’re not into it,” Lamb said. Basic gloves can be found online starting from $6.99 and many tutorials are supplied through YouTube as well as other sites. Be the first to comment on "Glovers shine a light on dance movement"